Sedimentary rocks - rocks that have been weathered from another rock - doesn't matter what type - and formed in water or transported by water. Alluvial fans conglomerates that have formed on a mountainside and cemented by subsequent deposition of a substance, such as calcite, are sedimentary rocks even if they were not formed under water. JimBob, I'm surprised a soft rocker (folks who study sedimentary rocks) like yourself would include only clastic (made up of particles eroded from other rocks) rocks as sedimentary rock. Other sedimentary rocks, like limestone and coal, are created from biogenic activity- animal and plant remains that accumulate and are lithified. There are also chemical precipitates, such as evaporites, gypsum and certain iron formations. NO, Ignimbrites (volcanic ash that falls hot in the air then solidified while still hot) are NOT sedimentary rocks. Whats wrong with you guys??? However, lahars are classified as sedimentary rocks. A lahar is basically a volcanic mudflow, commonly occurring during the eruption of stratovolcanos. Hot waters circulating in the volcano alter the rocks into clays; when mixed with water (snowmelt or surface waters), becomes a muddy mess that can quickly move down the slopes and runoff channels. How would you classify hydrothermal sinter or travertine (I've seen it both as sedimentary and igneous)? Probably right as far as the least dense rocks- however, I've also seen some chalk rocks (sedimentary) that will float. Not sure about most dense- some mineral deposits classified as sedimentary are more dense than "formed from molten material" rocks. 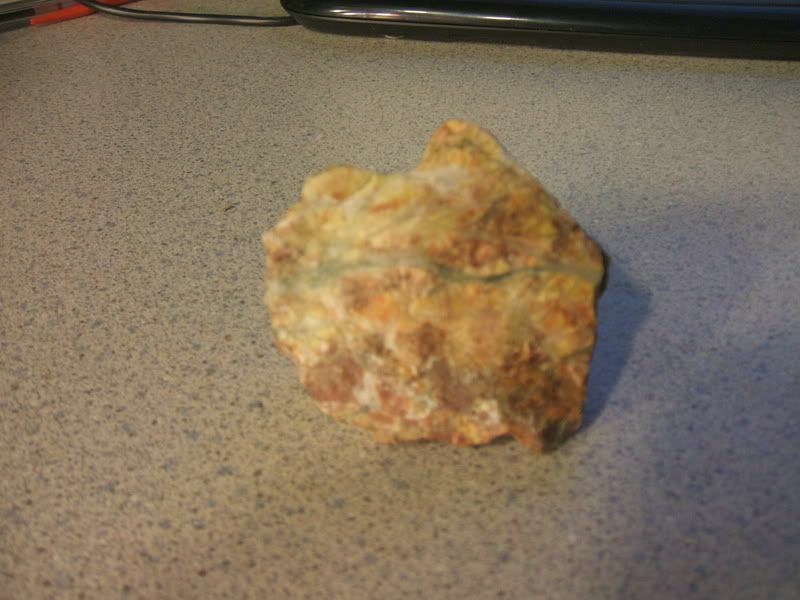 Metamorphic rocks can also be very dense, especially silicated rocks. A better definition for metamorphic rocks- rocks that are changed by physical or chemical processes in response to heat and/or pressure- but not to the point of melting. Once melting occurs, the rock is considered igneous. This is nit-picking. 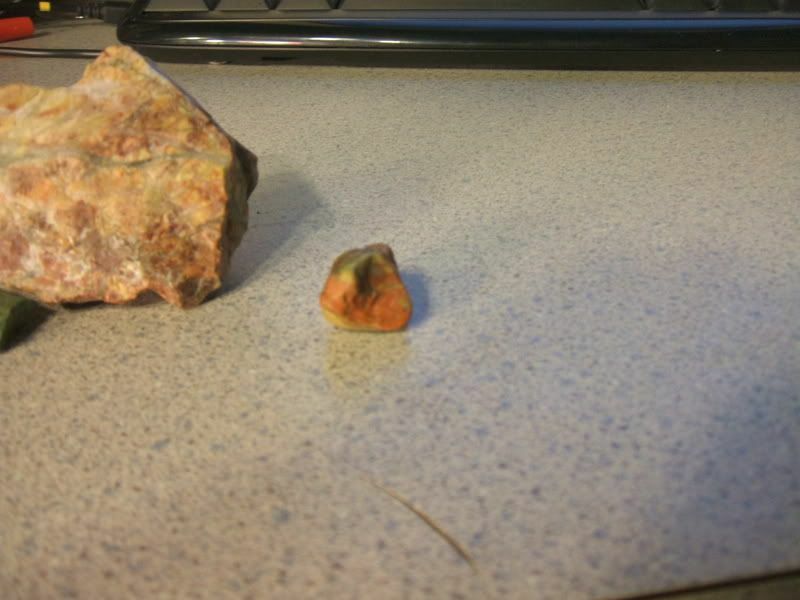 JimBob's definitions are more than adequate for the 3 types of rocks that occur on earth. Yes, it was Titanic but when I left orbit I had a sinking feeling I would never get back there. 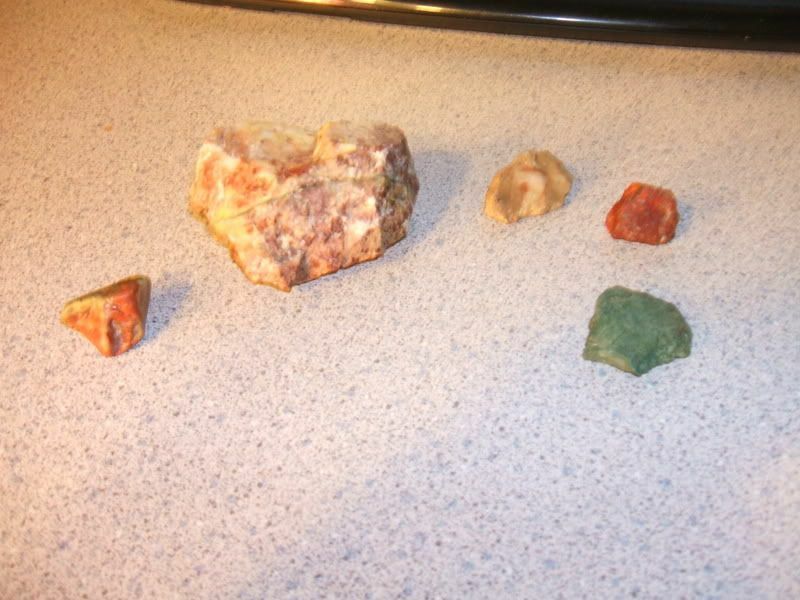 OK here are some rocks what can you tell me about them.. I found them today on my walk..What kind are they? I particularly like the green rock. Can you tell me any more about it? Can you scratch it with a knife? Does it feel smooth, or rough? Can you see any crystals in it? 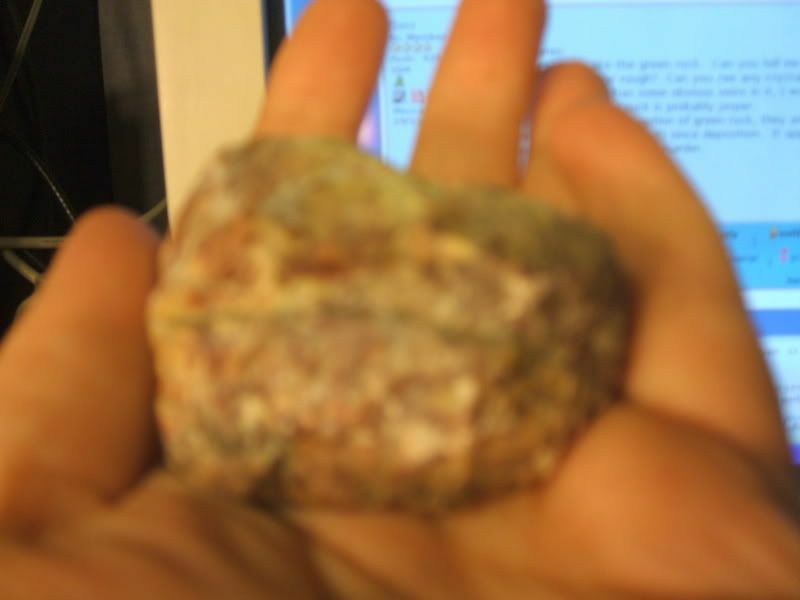 The larger piece has some obvious veins in it, I would guess quartz. Also some iron staining. 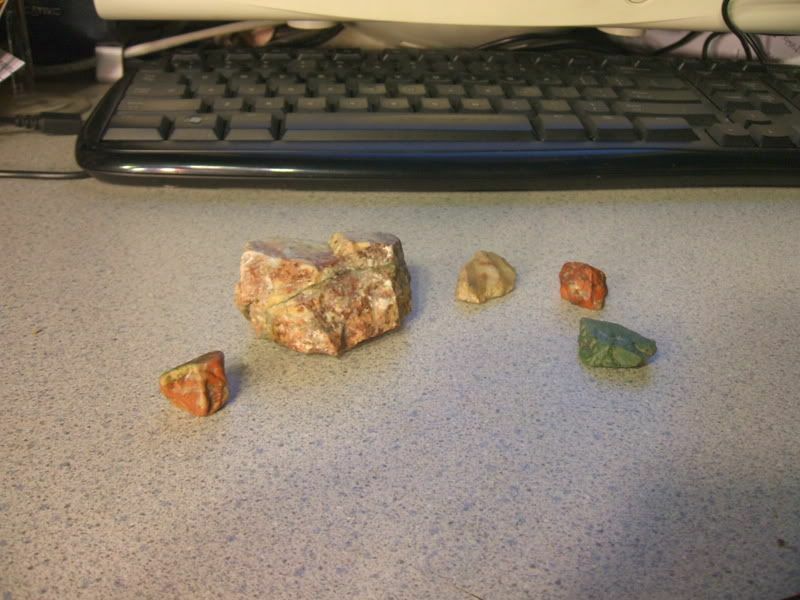 The small dark red rock is probably jasper. With the possible exception of green rock, they are probably all sedimentary- although they've probably all been altered (or changed) since deposition. It appears that all these rocks may have been silicified (silica added), making the rocks harder. Nope can't scratch it with a knife Smooth on one side and has some texture on the other side. It has some teeny tiny holes on the smoother side harly visible like you might have seen if it were to boil. needle size tiny needle. 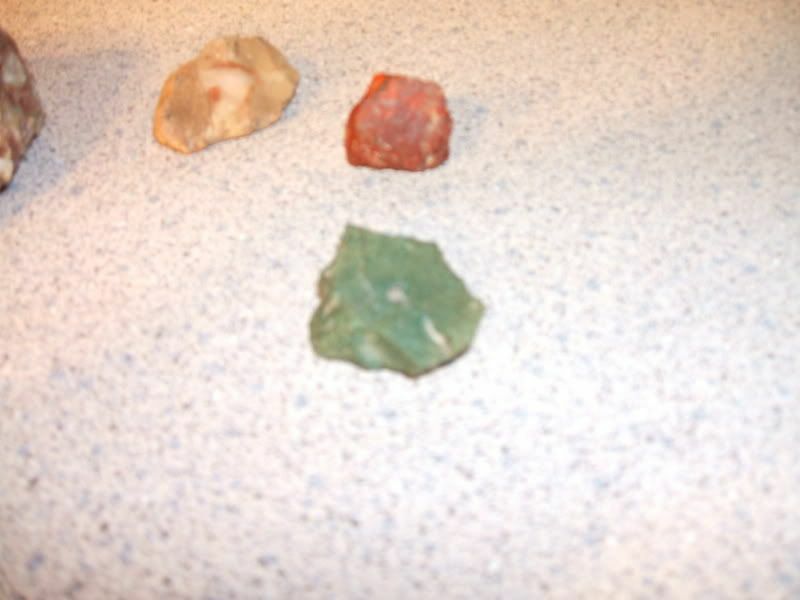 No crystals that I can see but it is super hard and pretty green.. me favorite color! The big rock the picture is deceiving.. 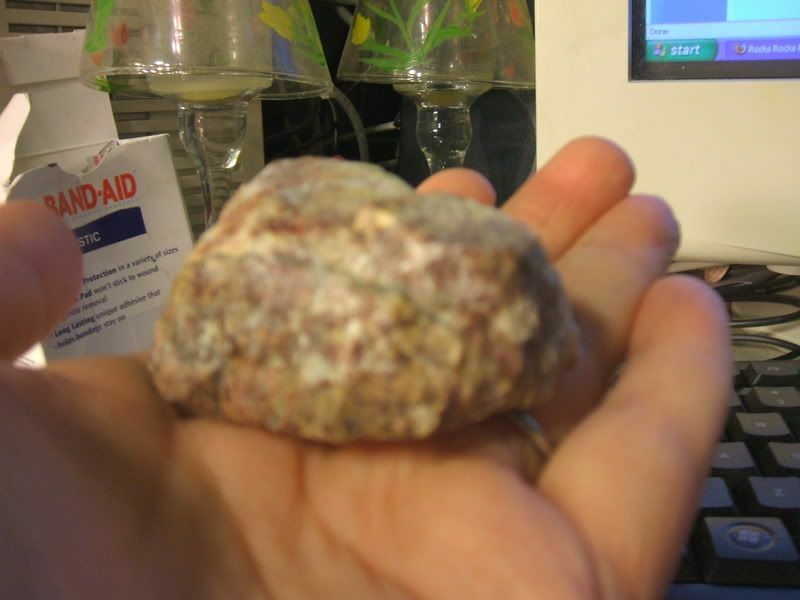 It is not that color It is burgandy around the bottom with whit splashes On the top there is a large white section on the back..
larger rock may be volcanic? Hard to tell from the picture. Oh dear that middle picture is so blurry..Sorry.. aai will try tomorrow to get a better one. Thanks bass. What did you think the green one was? The color is close to fosterite (ultramafic mineral), but my guess would be diopside/augite (mafic minerals). Minerals can be divided into two end spectrums- mafic and silicic. Mafic minerals tend to be iron, magnesium and calcium rich. In general, ultramafic and mafic minerals come from the mantle, silicic minerals from the continental crust. 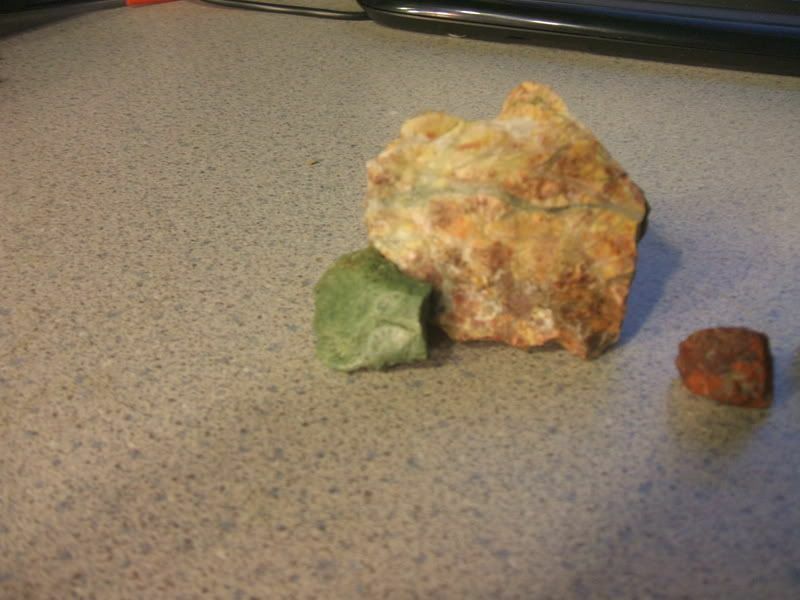 Fosterite, diopside and augite would form as metamorphic minerals from mafic igneous rocks, which is reasonable for your location. I know all about Rocks ! 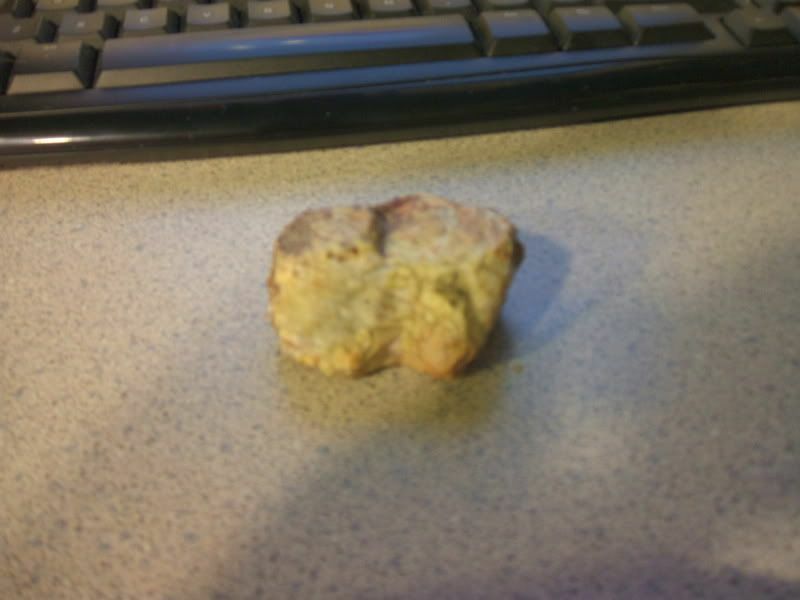 Here is is my expert evaluation of Karens Rocks. WOW.. YOU are amazing...What Knowledge lies in that Brain of yours!!! HEE HEE HEE! LOL..Thanks for the Info! The green one is very beautiful. Do you think it could be cut into a heart shape And polished?? I could not even scratch it with a knife.. I love the color and would also like to make a necklace out of it! What about the red one? Do you think it could be made into a single stud earring? It really is not orangy red? Sorry Neily it is quite brite red...! My camera does not seem to be doing a good job with closeups or the color.. LOL! Really, it is the photograper! LOL..!! Me is not good with a camera! LOL~!